What started as a tongue-in-cheek response to a letter from Steve Jobs that was arguably reminiscent of high school, the "Adobe heart Apple" campaign has taken on a more serious tone. Adobe, which originally admitted it could improve Flash to meet iPad standards, is still working hard to stir up consumers. The first round of advertisements, including The New York Times and The Wall Street Journal, state, “We ♥ Apple” in large, bold lettering. The second round dumps Apple in favor of "We ♥ Choice". Adobe also spells out its position on its Web site. The ad campaign was a gamble, given that the stakes for Adobe to retain Web video dominance is high. And there is no denying that it has paid short-term dividends in some sectors. First, it gave Driod fans something to talk about. Second, Citi maintained a 'buy' on Adobe Systems Inc. and a Citi analyst concluded that catalysts are biased to the positive side. Third, the campaign afforded Adobe an opportunity to put itself in front of the classroom. But about that third win. It might have worked too well. Adobe might have had the players in place to speak, but its message was deep enough for the "lights, camera, action" sequence that followed. Sure, the company was well-prepared for first tier questions about whether Apple is stifling creativity. But it wasn't so prepared on second tier questions tied to what Adobe might do better. Adobe's Win Becomes A PR Challenge. It's difficult for any company to win a long-term public relations battle based on "openness" while erecting walls at the same time. And in this case, it's hard to miss that Adobe is all too comfortable saying it will stick to "its facts" while Microsoft and Apple can stick to "their facts." Let the media and consumers decide, they say. The net result has become a debate of sorts between some writers at BNET and ZDNet and two camps of consumers. But as far facts go, Adobe is the more selective storyteller. At the beginning of this year, only 10 percent of the video content on Web was HTML5. That figure has changed dramatically, with as much as 26 percent of online video HTML5. If change can occur that quickly, video market share dominance is moot. Sure, Adobe can favor choice. But it might as well admit that choice is working against it. So is its message to investors. During an earnings call (hat tip: ReadWriteWeb), Adobe CEO Shantanu Narayen told investors that Flash was "synonymous with the Internet and frankly, anybody who wants to browse the web and experience the web’s glory really needs Flash support." Where is the choice in that? It seems to me that the dvertising campaign seemed to work in that it sparked the conversation that Adobe wanted to have. 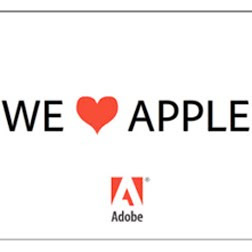 But as an integrated communication strategy, Adobe is coming up short. They aren't prepared to have open conversation. It even makes me wonder whether Narayen ever learned that oh-so-valuable lesson from first grade. When you hope to look smart by being the first to raise your hand, always keep in mind that the teacher might call on you. Oh, if you do want to view Flash on an iPhone, there's an app for that.